Destination: Srinagar -Kargil - Leh – Alchi - Pangong lake -Nubra valley - Tso Moriri lake -Khardung La Pass - Leh. Duration: 10 Nights / 11 Days Package. Day 01:-ARRIVAL SRINAGAR - SHIKARA RIDE: - On arrival at Srinagar, you will be met by our representative at the airport and transfer to Deluxe Houseboat. Evening Shikara ride on Dal Lake to enjoy the sunset on the Lake. Overnight at Houseboat. Day 02:- SRINAGAR - KARGIL (205 km) Leave in the morning and drive to Kargil by car road passes through the panoramic village reach Sonmarg (2740 Meters) After Sonmarg most rough road and wet Zojila pass 3527 Meters (Gateway of Ladakh). Continue drive towards Drass (The second coldest inhibited place in the world) we stop here for tea and passport check. Another two and half hours’ drive will take us to Kargil (2710 Meters) which has got its importance after opening of Ladakh for tourists in 1974. Overnight at Hotel. Day 03:- KARGIL - LEH(235 km) Leave in the morning full day drive to Leh today we have to ascend three passes this day will be tiresome but panoramic too. First Buddhist village will be Mulbek. We have to cross the highest pass (Fotula 13749 ft.) on Srinagar Leh route. At lunch time we will be at Lamayuru oldest monastery. Continue drive to next village Nimu a view of Zanskar River following into Indus. Finally we reach Leh 3500 Meters. Overnight at Hotel. Day 04: LEH - PANGONG LAKE(160 Kms) After Breakfast leave for Pangong Lake 14,500 ft, through Changla Pass 17,350 ft. (third Highest Motorable road in the world.) Overnight Camp. Day 05: PANGONG LAKE - LEH (160 Kms) After Breakfast drive back to Leh, enroute visit Hemis, Thiksey Monastery and Shey Palace. Overnight Hotel. Day 06: LEH - NUBRA VALLEY (120 Kms) After Breakfast drive to Nubra Valley via Khardungla (Highest Motorable road in the World, 18,380 ft). Arrive at Deskit by Afternoon. Rest of the day one is free to explore Deskit,Hunder Villages and camel Safari in Sand Dunes between Deskit and Hunder Village. Overnight Hotel. Day 07: NUBRA VALLEY - LEH (120 Kms) After Breakfast visit Deskit Monastery and drive back to Leh by same Route, crossing Khardungla Pass. Overnight Hotel. Day 08:- LEH (FULL DAY MONASTERIES TOUR) after breakfast. Full day excursion of Thiksey Monastery. It is better to visit early morning to see sunrise and praying ceremony. Also visit Hemis Monastery which is one of the biggest in this region. While returning to Leh visit Shey Palace. Return to the hotel for overnight. Day 09: LEH - TSO MORIRI LAKE (240 Kms.) Morning drive to Tsomoriri passing Chumathang (Hot Spring) along the Indus River. Tsomoriri Arr. 1600 Hrs. Afterwards takes a walk around the Lake to enjoy the scenic beauty. Overnight Camp. Day 10: TSO MORIRI LAKE - LEH (240 Kms) Dep. 1000 Hrs. After leisurely breakfast walk around the lake and drive to back to Leh. Overnight in Hotel. 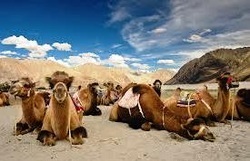 Day 11: LEH AIRPORT DROP: - Transfer to the Leh airport and fly back to Delhi with Sweet Memories of Ladakh. 01 Night accommodation at Srinagar in House boat. 01 Night accommodation at Kargil in Hotel. 01 Night accommodation at Tsomoriri. 01 Night accommodation at Pangong Lake in Hotel/Camp. 01 Night accommodation at Nubra Valley in Hotel/Camp. 05 Nights accommodation at Leh in Hotel. Shikara trip on Dal Lake in Shikara. All transfers and sightseeing by Exclusive Innova /Xylo car as per Itinerary. Mineral Water/Soft Drinks/Hard drinks, Laundry, and Tips etc. Tour Ends But Sweet Memories Remains Always. Please don’t hesitate to contact us for any kind of travel inquiries for Kashmir and beyond its borders. Let us to wish you a pleasant time, and hope to see you in Kashmir soon! From all of us invite you to join hands for Love and Peace. A waiting for your positive reply. Book a Houseboat or ​have a question or need a custom quote?